Planet Pleasures calls this adorable toy "Monster" but it reminds me a bit of Cousin It. 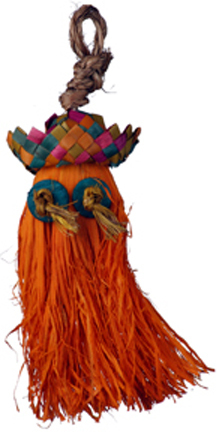 There's a woven cap on top (no threads), a couple coconut washer "eyes" tied on with colorful sisal and lots of colorful "hair" (colorful natural grasses) for preening and chewing fun. Perfect for the smaller beaks in your house! A loop on top for easy hanging ... makes a fun foot toy for the larger beaks in your house.